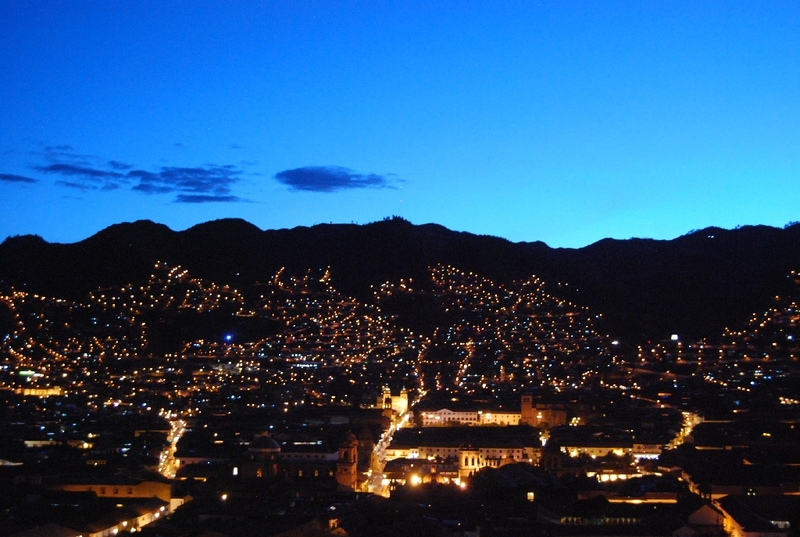 The city of Cuzco sits in a mountain valley surrounded by picturesque mountains. From their slopes you get incredible views of the city and its undulating landscape. To get to know the city we only have to climb its slopes. 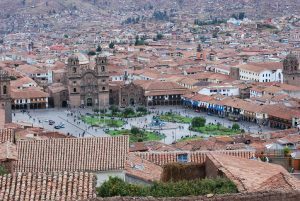 Just three blocks from the Plaza de Armas, Cuzco’s main square, you find the neighborhood of San Blas which rises up the slopes in a wash of white walls and dark orange tile roofs. Two blocks up you find the San Blas overlook. 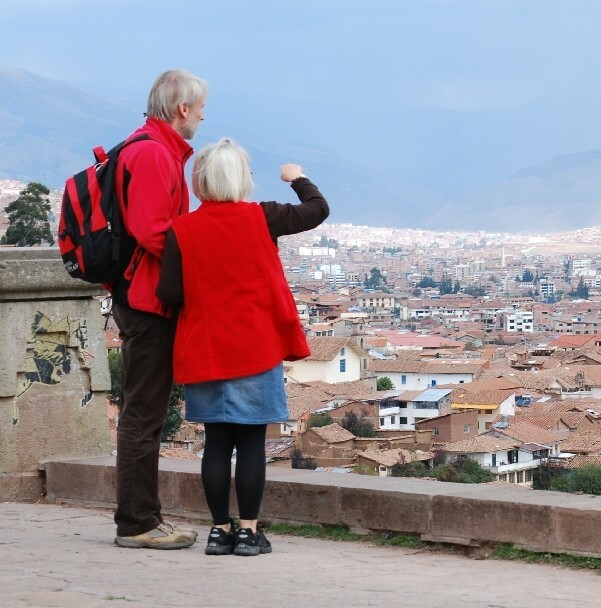 It is just a ways up the slope but from it you can view almost all the colonial and Inca city of Cuzco as well as the newer city stretching seemingly endlessly beyond. The overlook is calm with lots of space to sir, look, relax and reflect. Many people of there and sit for hours, absorbing the suns rays and reading, but more than anything else they enjoy the stupendous views. By the overlook there is also a small cafe with tables on its patio. Though small, the cafe has an unbelievable view which you can take in while sitting and having something to drink. El Mirador, The Overlook, is the cafe’s name. 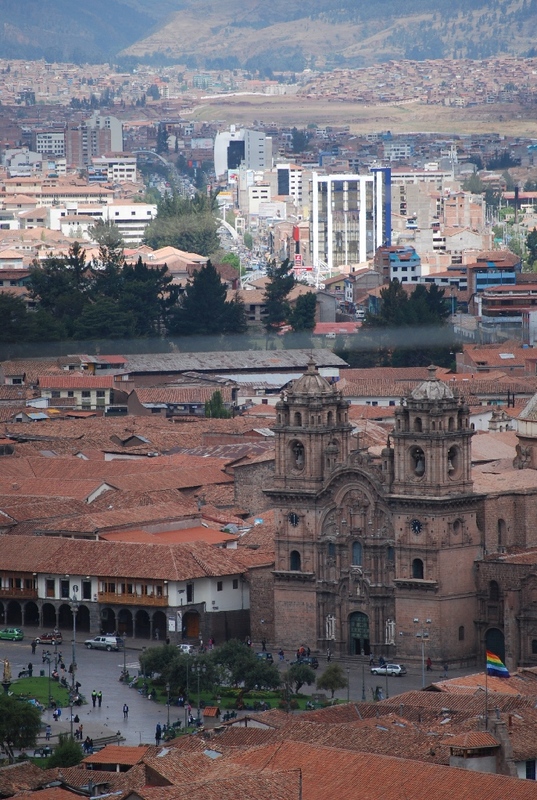 In addition nearby you find one of the most popular chicherías in the city of Cuzco. It offers the best of the natural, fermented corn juice. It also has the same name, El Mirador. Young people and older people, tourists and locals come to drink its refreshing beverage and take in the view. Some months ago the park of the overlook was remodeled. There used to be very large eucalyptus trees there which made the place ore hidden. Now, without the trees, the view is better and more ample. 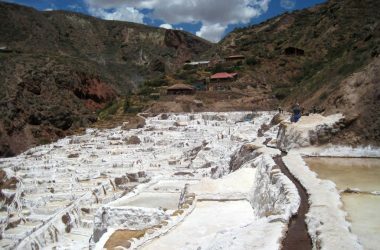 This spot in Cuzco also has information on the tourist attractions of the city of Cuzco. From the mountain tops surrounding Cuzco the views are really incredible. They are truly panoramic in their breadth. 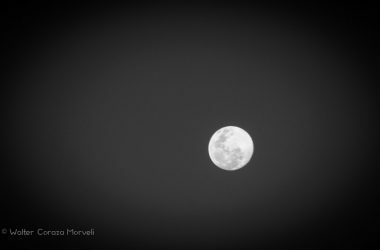 It is impressive to see from them the sunrise in the morning and a nightfall the moonrise. The moon gives its first light when it rises over the mountains at the southern end of the valley. Very early in the morning many people visit the overlooks to appreciate the sun’s rising and to receive Tata Inti’s (the Father Sun’s) first rays. 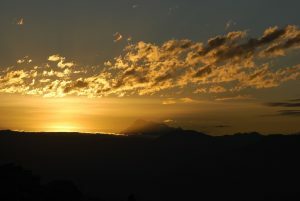 Around five in the morning the solar rays begin the day when they appear from the behind the mountains that are to the south, such as the magnificent Apu Ausangate which is the highest mountain in the Cuzco region. He stands out first, before the first rays of the sun can reach the city. 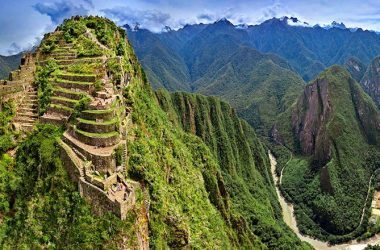 In olden times, the Incas would build overlooks on the highest points of the mountains. From there they could appreciate all of the surroundings and could keep track of what was going on. On the highest parts of the mountains you still find overlooks. Once they were towers to keep watch over the sky and land and know who was approaching. In Cuzco today there are various strategic points from which to keep track of life, like the Mirador de San Blas. 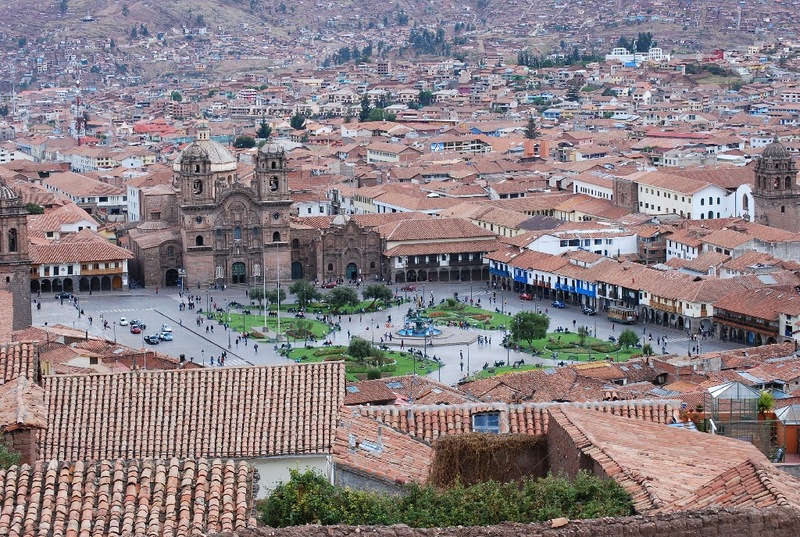 From these points one gets different views of Cuzco. 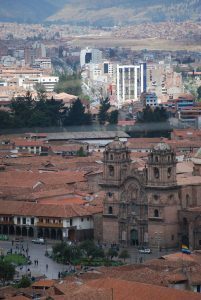 The most visited overlooks include the Mirador of San Cristobal from which you get a splendind view of the city’s Plaza de Armas as well as its end in the imposing mountain Ausangate. 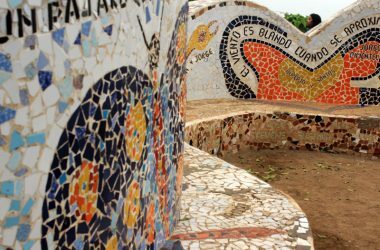 Every day numerous tourists come to this spot to enjoy the panoramic view and take pictures of the city. On the other side of the mountain there is the Mirador of Santana, the Mirador del Balconcillo, and the Mirador of Sacsayhuaman, each with unbelievable views and safe to visit during the day. 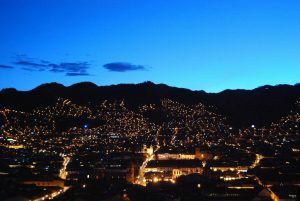 From these places you can see the whole city of Cuzco, from beginning to end, with its whole puma shape that gives form to the city. Let us go up the mountains to enjoy the views of this beautiful land of Cuzco.